You might be getting ready to open your door this Easter weekend and feeling overwhelmed. Anyone? Many cringe at the thought of hosting strangers, friends and family alike. There are many excuses that prevent all of us from being hospitable, but there is no excuse God can't help us overcome. I am not an exception, I have let many excuses hold me back but I have also been blessed by others hospitality, I know what a gift it can be. So let's examine some excuses and see what biblical hospitality is and is not. Excuse #1 - I Don't Know What I Will Prepare and Wear. Somewhere along the way we were told to be hospitable, you had to be Martha Stewart. You needed the right dishes, the right napkins, the right food, the right attire, and it all needed to be Pinterest worthy. The latin root word for hospitality is hospes, which relates to words like hospice, hospital, hostel and hotel. When you think of the word hospice and hospital, does entertaining come to mind? 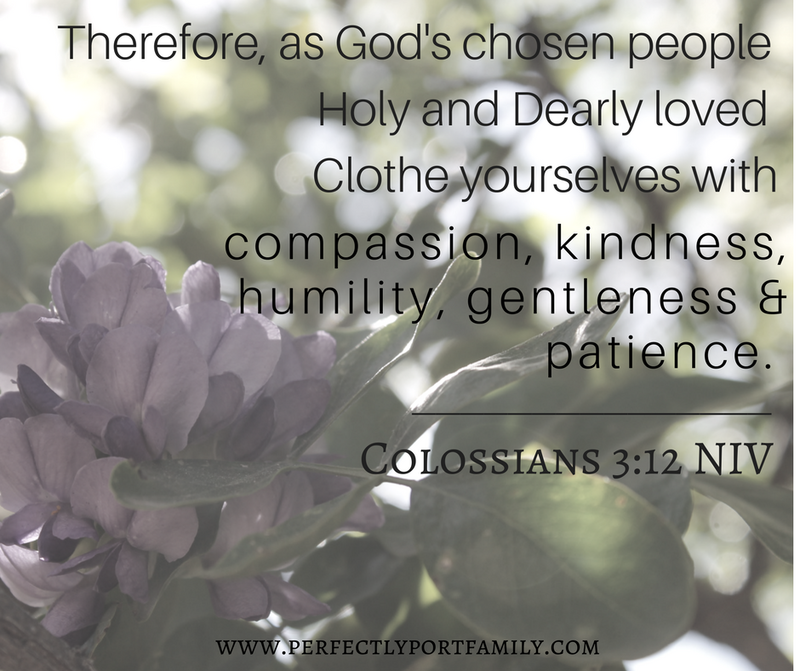 Hospitality focuses on serving others needs. The conclusion of Luke 10 recounts Jesus' visit to Mary and Martha's house. There are some important take-aways as to what Jesus thought was most important to consider when providing hospitality. Rather than do as Martha suggested, Jesus didn't put Mary to work instead he gently rebuked Martha. He told Martha, she was distracted by all the preparations and meanwhile Jesus is in her home. Jesus! Mary was at His feet listening to what He said. Mary had chosen what is better. Excuse #2 - My House Isn't Right. My house is too small, my carpet is old, this project isn't finished, my couches are out-dated. My driveway is too short, my house is too far out, and the list goes on and on. We have all said it. We think we have to have the perfect home to provide hospitality. Abraham in Leviticus 19 quickly invited foreigners into his tent. His tent. When you are invited to a person's home for a meal or a social, do you think, man I really wish they had more up to date furniture, they should really replace the carpet or buy a bigger house to accommodate us all? I hope the answer is no. Generally when someone invites you into their home, you are grateful. 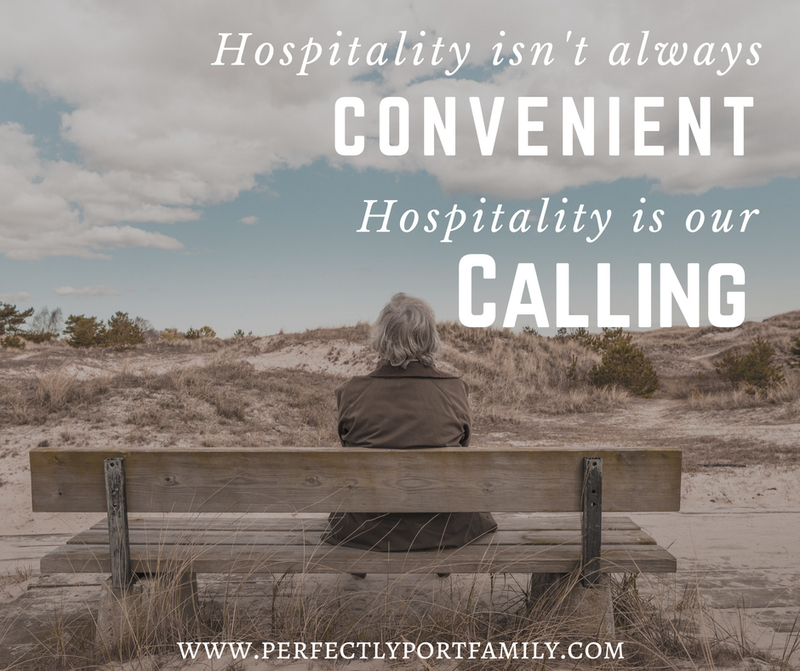 Hospitality is not about having the perfect house. It's about inviting people into your home. Excuse #3 - I Am Just Too Busy. Our schedules are FULL these days from athletic activities to job demands, there is barely a moment to breathe, let alone have people over for dinner. We all can relate. Both Abraham and Mary & Martha most likely did not have advanced warning of their visitors' arrival. There were no text messages -- we will be there in 3 days, just walking across the desert plains. They stopped what they were doing and made it a priority to welcome people into their home and serve them well. Why would they do that? Why should we do that? Jesus laid His life down for us. Although we may never lay our physical life down for our friends, we can lay down our to do list, our agendas and our concerns to serve others. Jesus is our example. Excuse #4 - I Am Not Good At It. When I started running, I stunk. I mean I sucked a lot of wind without a lot of momentum. Every time I went out and practiced, I got better. It still was hard, uncomfortable and sometimes painful but I kept trying, I kept going. Especially, if you grew up in a home where hospitality wasn't modeled, you might find it especially difficult to know where to begin and how to do it. It doesn't have to be perfect out of the gate, that's not the purpose, as we have already established. It could be as simple as inviting a friend over for a glass of ice water served straight from your faucet. When it comes to anything -- practice makes progress, progress leads to proficiency, not perfection. Watch others and rather than compare, observe for inspiration. Allow them to model for you and then take that learning and apply it. Hospitality is not so much about what it looks like but the act of obedience. Excuse #5 - I Have Kids. 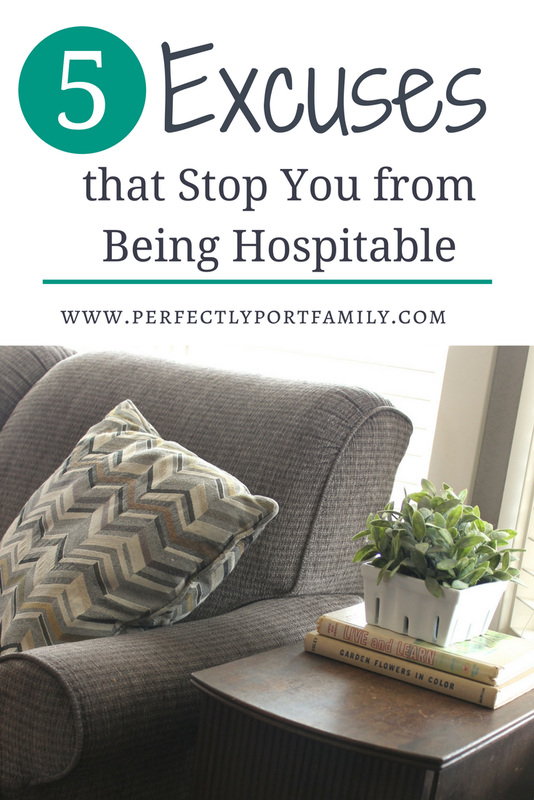 Hospitality is harder with kids but not unattainable. Hospitality is a gift we can give our kids in allowing them to serve alongside us. 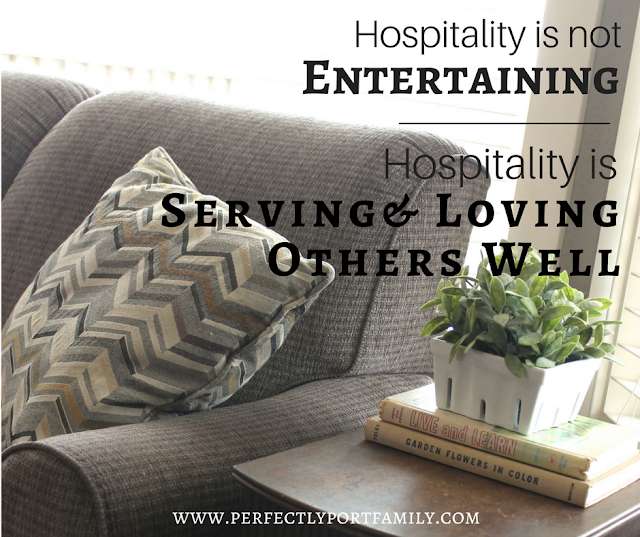 Hospitality is a perfect avenue to model for kids how to serve others. It gives them opportunity to take coats, open doors, wash dishes, refill glasses of water, and entertain the smaller guests. Letting your kids know that you are inviting people into your home to love them well as Jesus calls us to do is a purposeful application of living out the gospel. As an aside, It's always good to be in agreement with your spouse before making plans. I have made that mistake of extending an invitation without consulting your spouse. It's their home too and you want to be on the same page. A simple ask goes along way! Hospitality can and should be a family venture. Hospitality is sacrificial and not always convenient. Someone might need a meal, a visit or a hug when you have a long to do list, remember Jesus told us to love one another as He loved us. He was often inconvenienced but never turned a person away. Hospitality is about relationships, service and providing for strangers and friends alike. Hospitality is a tangible way to show the gospel. He is our example. He showed hospitality in the midst of crowds, along the water's edge, while he was alone, and when He walked along the road. He fed 5000 with just a few fish and loaves of bread. He is our example and He served well, He loved well and He asked us to do that too. Hospitality is about loving well so open the door with a big smile and a warm heart, pray for God to meet you there and He will. Focusing on others will never be a mistake.